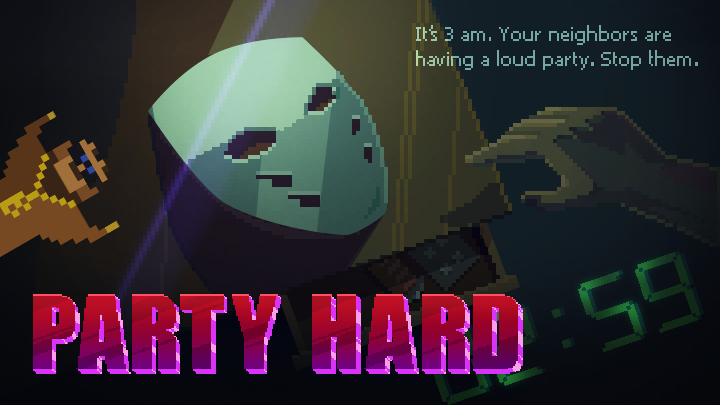 In Party Hard, players are able to fulfil that secret desire to murder everyone at that noisy party next door. Calling the police, complaining to the neighbour hosting the party or doing some passive aggressive resistance is far too complicated after all. Plus slaughtering them all is much more entertaining. There’s a very simple story to the game so story fans shouldn’t expect anything amazing from Party Hard; the player takes control of Darius, a man who is unable to sleep because of a party happening next door. After dealing with the local menace, Darius then continues on his mission across the United States while the police hunt him down. It’s a very dark premise but there’s plenty of dark humour mixed into the cutscenes as the story unfolds; the humour is just enough to prevent the game from coming across too seriously and makes it quite lighthearted at times. Despite the game being one giant slaughter-fest. Darius travels across the United States to visit all types of parties and stop the party-goers from ever going to another one. The locations are spread across the country and there is only one level per location. There are 12 unique levels to play through with the main story and a bonus 7 more levels to complete after this; each of the story levels are separated by a short cutscene to explain the story. Each level takes place in a new location and there are random variations for them which keeps them interesting and can make them quite challenging. While each level is composed of several similar areas, they all have a unique setting that force the player to re-think their strategy; the player views the game from a top-down perspective as they cause chaos at the parties. The aim of the game is simple; to everyone at the party and not get caught. This is where the stealth-strategy gameplay comes in as the player needs to kill each party-goer without being apprehended by the authorities. Players can kill those attending the party with a small range of options which can become repetitive in the later levels of the game. Attacking with a knife is the primary method of attack but players also have a number of environment traps that can be used to kill NPCs in more entertaining ways. There are also several items available to the player which can be used to help in isolating targets or to kill a large number of characters. Once a NPC has been killed, the player needs to deal with the body to stop the police from being called to investigate. Bodies can be hidden or disposed of differently on each level but being caught dragging one away will cause the police to chase the player. There are plenty of ways to get caught or to trigger a police chase so players need to remember this is a stealth-strategy game and be extremely stealthy while slaughtering the noisy party-goers. While there are plenty of ways to complete the objectives, there is nothing like dancing in the middle of the crowd to avoid getting caught by the police or just to see how the party-goers react. Despite the repetitive nature of the gameplay, it is still very satisfying to complete a level. There is no ‘combat’ in Party Hard and players looking for an action-packed game will be disappointed with this one; players can’t kill the police or other authority figures in the game with their knife and getting too close to them will be an instant game over. It’s still possible to kill them with traps and items however if the player times them well. Players can expect to see a range of enemies as they play through the game; even the party-goers can be dangerous to the player as they can attack if the player dances too close to them. More potential enemies can be summoned with a phonecall however, these summoned enemies also kill a large number of the party-goers. There are plenty of ways to use enemies to the player advantage as they can also attack or kill other characters in the game. Enemies are quite limited and don’t always seem to be very intelligent; they can certainly be frustrating to deal with at times however. The later levels in the game can be especially tricky when the FBI are involved as these enemies will actively hunt the player down and notice them despite how many NPCs are surrounding the player. Party Hard uses 2D pixel graphics that work nicely for this type of game; the different areas of each level are easy to identify and items around them are easy to spot. After playing few round of the game, it’s easy to spot where the traps and body disposal sites are on each level. While the graphics are nothing spectacular, they work well for the game and are varied enough to allow players to create their own unique levels for the Steam Workshop. There is no graphical difference between the PC and the console versions of the game; players should remember however that creating and sharing content is limited to the PC version. 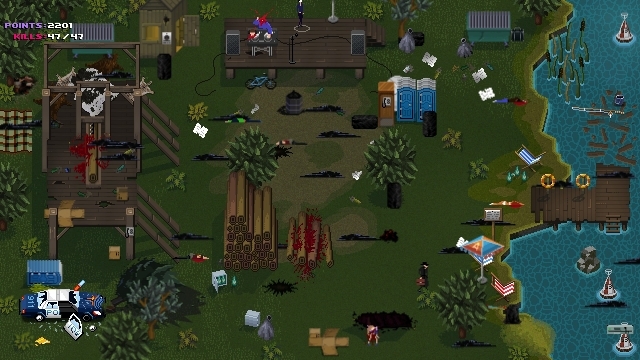 Indie games don’t always have good soundtracks and Party Hard has a great one; the music is almost a perfect balance for the mass murder that the player is happily engaging in. It’s music is catchy but repetitive which can become annoying when spending a large amount of time on one level. In addition to this, the game also includes good audio which matches the events in the game and adds a level of realism to the game. This may be a relatively short game but considering the repetitive nature of the gameplay, this is a very positive point for the game. The gameplay is exciting at the start of the game but the lack of new features does make the game feel quite tedious towards the final levels, especially for the final story level involving the FBI. It’s a nice short game which should entertain most players for several hours and the added Steam Workshop bonus on PC can provide many more hours of content; the plot is very weak and emphasis is placed on the gameplay itself. Party Hard is a nice game but does have its problems which could frustrate some gamers.